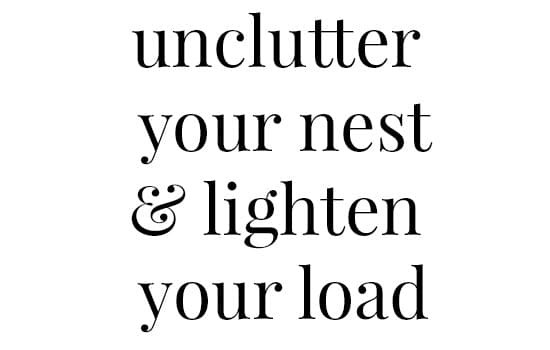 Unclutter Your Nest and Lighten Your Load! Welcome to the Unclutter Your Nest and Lighten Your Load Boot Camp! I am so pleased that you are joining me on this month-long unclutter-ing of our homes, and by extension, of our minds. I am truly not a hoarder, but we have accumulated way too much stuff in our 30 years of marriage. We have a home with an attic, as well as crawlspace storage, so it’s been very easy to stash stuff away without realizing exactly what we are stashing and what we are accumulating. We are planning on putting our house on the market in the near future and I have no intention to pack, move and unpack stuff that I really don’t want, so it’s time to get this unclutter party started. And January is always a great time to unclutter your home and mind in anticipation of the year to come. There are links below for a printable calendar and a discard list. I find it motivates me to dive into a project with both feet and seeing the fruits of my labors really encourages me to keep going. This plan has me focused on this one thing for the month of January and therefore more likely to get it done instead of dragging it out over a longer period of time I will also be documenting what I'm discarding which is motivating, but will also be helpful for tax purposes as you can deduct the fair market value of your charitable contributions. Just remember to try to attach a value as you go along. Here is a site that will give you some guidance as to the value of your charitable contributions. And because it'll be even more fun and even more motivating…I am going to weigh what I take out of our home. The load that I take out of my home will be both physical and emotional. I really have no clue what all my discards will weigh, but I'm very curious. Let's just say that the number is 500 pounds, which is not unreasonable given the number of books we have in our home. If I do move 500 pounds of clutter out of my home, there will be a huge weight lifted out of my home (literally) and off of my mind (figuratively). Plus…I'm a quantifier. To be able to say that I got rid of X lbs of stuff is easy to wrap my mind around. We mindlessly add things to our lives and rarely subtract without great intention. It is easier to keep an uncluttered home clean because there are fewer things to physically clean, keep track of and put away. It is easier to find things when we have fewer things to look through to find what we need. I bought my high school aged son a thin, paperback book about preparing for college several months ago., but now we can’t find it. He has so many books and magazines in his bookshelf and so many games in his closet that we have been unable to locate this relatively thin book. We are a family of readers and I love having books in our home, but many of these books and games he outgrew years ago. So guess what, we had to buy this book again! It’s a little embarrassing to admit this, but now you know why I’m doing this boot camp! A 2011 Princeton study found that when your environment is cluttered, the resulting chaos limits your brain’s ability to effectively focus on other things and to process information. Clutter is distracting. You will be much more effective in processing information in an uncluttered, organized, and serene environment. Along the same lines, Karen Kingston, author of Clear Your Clutter with Feng Shui writes “Everything around you, especially your home environment, mirrors your inner self.” A peaceful, uncluttered environment leads to a peaceful, uncluttered mind. There are surely items in your home (clothing, décor, utensils) that you really regret buying. Or there might be a pair of pants that don’t quite fit you the way you want them to. Seeing these items on a regular basis only stir feelings of frustration or regret. If you aren’t using the item or if you don’t find it beautiful, and it’s only causing negative feelings then you need to get rid of it. If you decide that there are some things of value in your home that don’t bring you joy or that you don’t find useful, you might be able to earn some extra money by selling them on ebay, on Craigslist, at a consignment store or at a garage sale. In your decluttering process, you may unearth things that you forgot you had and actually find beautiful or useful! It’ll be like Christmas all over again. 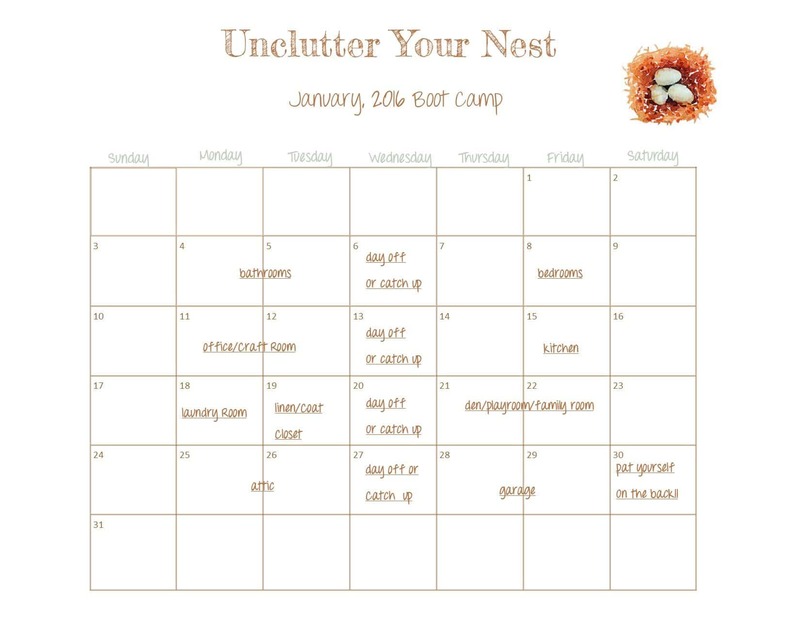 The calendar I have prepared for my Unclutter Your Nest Boot Camp has us working 4 days a week for the entire month of January, going room by room. The amount of time you put in each day is up to you. You'll be surprised how much you can accomplish in 30-minute increments. For many of you, this schedule may not work into your ‘real life' schedule. No biggie. This is just a proposal and feel free to move days around to better suit your life. You may only be able to dedicate the time to this project on weekends. Work at your schedule. I will send out ideas and encouragements based on this calendar, but you can also bookmark them, pin them or just come back to them later. Each weekend I will have a post dedicated to the two areas to be cleaned that week in your mailbox, with suggestions, information and motivation. Make sure you are subscribed to this blog so that you get these weekly updates. You can do this in the box located in the upper right area of this page. Put in your email address and hit the ‘hit it' button. In addition to the calendar link (in blue right above), I've prepared some discard sheets (in blue right below) for you to document your discards if you chose to. I definitely get motivated when I can document my progress, but that is just me. I give myself a little ‘you go girl' each time I reach 50 items/categories. Use the sheets if they will help you stay motivated and accountable. update 1/3/2016…Because mom always knows best…I've attached another discard sheet with columns for the quantity of each item discarded and a place to calculate the value of your donations for tax purposes. Thanks for the suggestion mom. I will have 5 bags or boxes that I will take to each room; one for Trash, one for Recycle, one for Donate, one for Sell and one for Relocate. Take a few minutes to figure out where your stuff will go. Click here for some organizations that will gladly accept your gently used items, as well as some options for your recyclables. I will have my water bottle filled with water, and maybe a squeeze of lemon. I will bring a rag and a spray bottle or a bucket of soapy water. I will have some great music playing, either on a CD, a radio or my Pandora station. I'll keep track of what I'm taking out of my home by listing each item or category of the item on the included sheets. Not only will these sheets help me at tax time, but they will also motivate me. If I've written down 37 items in a room, I'll do my best to get to 50. Surely there will be some tchotchke or knick-knack that I've overlooked. When I'm done with each area, I'm going to weigh what is leaving my home! I'm excited to see what my final tally ends up being. Oh, this sounds like so much fun!!! I’m in! Although I de clutter all the time, I’m a de clutter fanatic, a de~ clutter~ holic. I love it! But I’m sure I’ll find stuff to de clutter, actually I wanted to do a re do and de clutter of my desk space, so this is great! Also what you say is so true! It’s so freeing to get rid of stuff, makes me feel so light and just ahhh! I had to de clutter for each of our moves from Europe to North America and back, so really, a lot has flown out…literally. But stuff accumulates so easy and with kids…oh my. Your calendar is a great way of organizing and staying on top of things! And I’ll turn on my music and have a chocolate with it as well…lol! Happy New Year Lynn!!! Have a great night, sending you lots of hugs!!! Hey Katrin! How was your trip? Did you go to the Viktualienmarkt? I’ve missed you! So glad you’ll be joining the Boot Camp! We’ll get lots done! This is SO COOL!!!!! I downloaded your sheets and I’m going to do my best to unclutter right alongside with you. This is seriously such a good idea! I’m trying to get my friends in on this too. I like your strategies and motivational tactics with the numbers and lists. I’ve gone through my belongings several times, but I think that your methods will help me really make a difference in my home. So excited!! Oh Gina, I’m so happy that you think this method might make a difference for you in your declutter. These tactics turn the process into a bit of a game for me and keep me motivated and involved. Hope that they do for you too. Can’t wait to see your progress! InstaGram your photos to #unclutteryournest. So glad you’re joining in the fun! Get your bags and boxes together! Great Tips! thanks for sharing 🙂 sometimes decluttering can be overwhelming, but I like how you set out a great timeline & guidelines! Thanks Mattie, We all Learn and Do differently, but I find I need to really just dive in and get it done. The documenting process also turns it into a bit of a game for me. Hope you’ll be joining in and sharing your successes! I can’t wait to see before and after photos!! What a great idea, and this is structured so well. Hi Allison, thanks so much for compliments. I am anxious to get the declutter really started. I appreciate you stopping by today. Hi Allison, thanks for stopping by to visit today. I’m anxious to get started in this process…chomping at the bit. I’ve been making myself do some other chores before I ‘allow’ myself to jump in to the declutter…yeah…I know that makes me sound a tad off. Thanks for this great post, it has served as a gentle reminder that I need to declutter a bit after this holiday season. I’ll start that after I get home from my inlaws on Saturday. The calendar is fabulous and I’m definitely going to use it. This is so perfect! we lack free space in our place so we were just talking about how we need to stop hoarding so much and get organising but didn’t know where to start! this is so motivating and just what I needed! great tips and advice! I love how easy and manageable you make this sound. I hate clutter. It drives me up a wall, so decluttering is always on my schedule. Hi Jessica! I hate clutter too, yet somehow I always manage to accumulate stuff. My daughter and I are spending this next week uncluttering the last few rooms in the house…it is even more fun with a partner. Enjoy decluttering your home, and starting the new year fresh! we live in a very clutter free house. My husband and I are both pretty minimal when it comes to having stuff around us, but I know that it is an area a lot of people struggle with and this sounds like a great motivational exercise! Good for you Leanne..I strive to be minimalist…slowly getting there. This will be a huge step forward. This time I have my husband’s buy in, so think it’ll be much more productive. Thanks for visiting Leanne. I’m a laittle late but I’m definitely in!! I’ll start with the bathroom, it may take me a little longer to do everything but I will definitely follow your order ! Oh this is going to be so much fun! Thanks for the motivation Lynn! Oh Mary, so glad you are joining in! You need to do it at your pace…I know your back is hurting you right now. Just do what you can when you can. If you get a chance, do post your photos at #unclutteryournest on Instagram…it’ll be fun to see how we’re doing. And for what it’s worth…weighing the stuff is really motivating us. Yippee!!! !Keep me posted on your progress. Thank you so much for extra motivation! On January 01, 2016 my husband and I took a full pickup truck load of furniture and household goods to our local ministry for a family in need. Hi Mimi…love that you took the truck full of furniture and household goods to someone who needed them. That is what motivates me…that someone can use the stuff that I don’t need or want anymore. Well done! And keep going. If you are so inclined…send your photos to #unclutteryournest on Instagram. Thanks so much for joining and for commenting! I’ve got some pics for ya! 😉 I’ve finished my bathrooms, moving onto bedrooms tomorrow! I’m really liking this. I just de-cluttered before the holidays, and I’m amazed at how much I’m finding to give away. I love seeing empty spaces!!! Hi Becky…I am loving this current declutter! I’ve got a good news/bad news house. The good news is that I have a great amount of storage space. The bad news is that I have a great amount of storage space. I don’t like visual clutter, but when it’s behind a cabinet door and I can’t see it…that’s a different story. Anyway, I’m being ruthless now, so nothing is off limits. Have a great Sunday and thanks for stopping by. I know you have your hands full…the clutter will still be there when your girls get older. In the meantime…you need to enjoy them. Thanks for stopping by and I’ll see you next week. Some great tips here and I like the calendar. We’re hoping to put our house on the market this year too so I seriously need to de-clutter and I find if the house is untidy it stresses me out. Hi Laura, getting the house ready to sell is such an undertaking. And I’m like you that I really don’t like to see clutter. My home has plenty of storage, which is actually not a great thing…the whole ‘outta signt outta mind’ scenario. I’ll just keep plugging along. Lynn, you know I love this! We did a bunch of clearing out and it amazingly made me feel so much lighter. About the same time I ran over my phone with the car, losing hundreds of contacts. Kinda funny, but not carrying around the details of hundreds of people that I didn’t talk to regularly made me lighter too. I had felt as if I needed to feel responsible for them. Some of the numbers I had been carrying for 5+ years and we hadn’t talked, it made me feel so heavy to continually carry that weight. Not that I don’t care about them anymore, I do, but sometimes we clutter up our lives and we can see out from under. It’ so freeing to let some things go! Love the analogy/similarity between decluttering your home and running over your phone, thereby losing your contacts. It’s similar to having all the stuff behind closed doors. You might not see it, but you know its there and therefore becomes a burden. I can absolutely imagine a great relief lifted off your shoulders. After all, you know the numbers of the really important people in your life and you know you can get the others somehow. And lets be honest, there are some people who do weigh you down…how cathartic to shed them too. Clear the clutter wherever it might be! Hi Maria, so glad you found it useful. Sounds like you and I are on the same plan anyway. Once you get started, its a bit addicting. Really motivated to see how much I can get out of my house. But I’m loving finding long lost things as well. Hi Trista…isn’t it fun! Although it is time consuming, I’m really dedicated and energized. Weighing all the stuff leaving my home has been enlightening and very motivating. I’m touching things that haven’t been touched in 10-15 years! That’s crazy when I think I about it that way. I’m finding things i didn’t even know I had! In any event, I’m glad to have decluttering buddies across the globe.